Hello friends, fancy making some fun Christmas tree decorations? Delicious buttery biscuits, with edible sweetie stained glass. 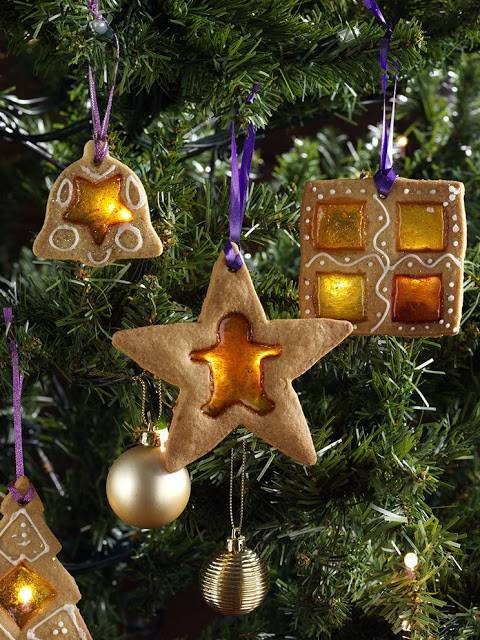 These edible decorations make the perfect gift and are ideal for hanging on the tree. Great for getting the kids involved, all you need are clean hands and a little imagination! A magical treat to enjoy at Christmas. Preheat the oven to 180°C/fan 160°C/ gas 4. Separate the boiled sweets into colours, place in separate plastic food bags and use a rolling pin to crush into pieces approximately 1cm and set aside. Beat the butter and Whitworths for Baking Light Soft Brown Sugar in a bowl, until pale and creamy. Sift the flour and spice into the mixture; add enough milk to make a workable dough. Use your hands to make a smooth dough. Wrap in cling film and refrigerate for 30 minutes. Sprinkle a little flour over the work surface, divide the dough into 2 pieces and roll it out so it is ½ cm thick. Using biscuit cutters, cut out Christmas shapes. Using smaller pastry cutters, cut out the middle of each biscuit and sprinkle the biscuits with a little Whitworths for Baking Crunchy Demerara Sugar. Carefully transfer the cookies to the baking trays with a fish slice. Place one or two pieces of sweet into the middle of each biscuit whole. Bake for 10 minutes or until the biscuits are just golden. Cool on the trays for a minute before making a small hole near the top of each biscuit with a skewer, so you can thread ribbon through the holes when they are cool. The biscuits can be stored in an airtight container for up to 4 days. Mix the Whitworths for Baking Icing Sugar with a little lemon juice or water to make a thick pipe-able icing. Make a cone out of greaseproof paper, cut a small hole in the tip and decorate the biscuits with the icing. When the icing is dry the biscuits are ready to hand on the tree! Make sure the sweets have set hard before removing from the trays. Recipe and photo credit by- Whitworths for Baking. How To Ice Christmas Holiday Cookies With Biscuiteers. Biscuiteers Stained Glass Window Biscuit Recipe. Mixed Spiced Christmas Robin Biscuits: Christmas Day Special. The Snowman™ And The Snowdog Biscuit Tin Review. These biscuits look really cool. What happens to them if you hang them on the tree?